I am looking at my calendar, it is June, and I think of my sister Ramani who passed away in tragic circumstances in June 1987. With her 50th birthday on the horizon, I think of her celebrating her life and all her accomplishments if she was still here with us. My thoughts often travel back to when we were younger, to Sri Lanka where we grew up as children, and to our journey to Australia. So many years have passed, with them the birthdays, Christmases and anniversaries, and I realise that every milestone is a mile more without my sister in this journey of our lives. Our childhood, and our friendships seem to hang from an invisible thread, like the spider web outside my window. I watch the breeze swing and tip it, expecting it to go down, but it doesn’t. Memories sway like the web, fragile yet strong, attached by an unseen force to a wave of emotions that sometimes take a quiet back seat but never entirely leaving the room of our hearts and minds. Today my thoughts are with my sister Ramani. 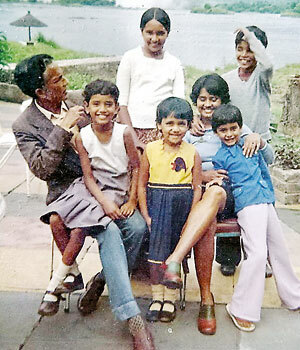 We grew up in Gampaha, outside the city life in Colombo. A house by the beautiful paddyfields was home. Tall trees crowded our property and the streets around, and the gentle breeze that drifted across the fields to the surrounding trees whispered with birdsong making music that rivalled anything inside. We loved the rhythm of waking up with the sun, to the invisible fragrances in the garden. Ramani was up first loving her sisterly responsibilities, often taking the time with the younger sisters to feed the squirrels that came down the mango tree. She told us stories that made us travel to places that we loved, we engrossed ourselves in the wonder and the loveliness of everything around us, and we offered a happy warmth to the entire street we lived in. And it was returned to us by everyone who knew us. As a family, we functioned as a protective seal sharing our love of home and hearth. Following seven years in Zambia, where my father’s work had taken the family, on our return to Sri Lanka Ramani studied at Holy Cross College, Gampaha. She was a cheerful and friendly student at school, loved by her teachers, Sisters and her friends. She was focused and determined with a sense of self and discipline, her long dark hair always tied back, and her immaculate white school uniform below the knees just as the Sisters ordered. She spoke with a smile, and she was a good student, well-mannered and respectful of the teachers and the Sisters. As children we spent nearly every afternoon with each other after school. We had chores around the house, sweeping the floor, setting the table for meals, washing our own plate but what we liked most was idling in the kitchen listening to the chatter of the women, eager to help stir and taste whatever was on the stove. I remember we all sat together for meals in the dining room, we talked about the day and one another. What strikes me the most when I think about my family is the innocence, and life could not have been safer, and the future more certain. Nonetheless, we learnt very quickly that life is fleeting! 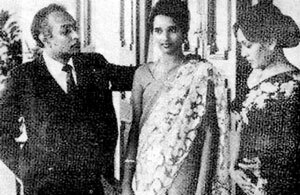 Ramani was only 16 years old when she was introduced to the screen by Lester James Pieris and Sumithra Pieris, friends of my father, making her acting debut in Yuganthaya alongside Gamini Fonseka and Richard De Zoysa. Another event that helped shape Ramani’s life further was her application for the Miss Sri Lanka pageant in 1985. Encouraged by friends, she took part in the pageant winning the title, and participated at the Miss Universe pageant in Florida. It was not her ability to act, or her beauty that captured the people, but her simplicity, a rare characteristic which often stood out. She graced the cover of many of the newspaper magazines, and appeared in advertisements for Singer products, Abans Tour Cars, Sri Lankan Airlines, Nestle, Vaseline Shampoo, Swarnamahal Jewellers, Mercantile Investments and the Mount Lavinia Hotel. Ramani also pursued a modelling career participating at the Colombo fashion shows and in Singapore, taking on the opportunities in the modelling industry. In the following two years Ramani made a series of popular teledramas, the most notable being Bhagya with Ranjan Ramanayake, and the song Aji Thapara Lahila sung by Deepika Priyadarshani left a lasting impression with her many fans. She had a lead role in Irata Hadana Mal, Himakumari, Salalihini Gammanaya, and the Sinhala stage musical Vivanga written and directed by Surith Haykanda.In addition to film and television, Ramani also appeared in the musical Hada Bandi Gee with Rupavahini produced by Sunil Siriwardena, and in the visual for the song “Duras Wannata Me Lesin Ayda Apa Hamu Une” by Dayarathna Ranatunga. Her popularity spread islandwide as her face with the engaging smile appeared on the television screens, fresh, young and beautiful. Ramani’s animated performance in the stage drama Makarakshya directed and produced by Dharmasiri Bandaranayake won her further recognition, not just for her formidable performances but for her humble demeanour. I remember accompanying Ramani to many of her performances in Colombo and outer regions where the theatres were not large and the power of her performance filled every corner. She was fresh, fearless and bold on the stage. As her career progressed, Ramani was determined to be independent, and wanted to live in Colombo despite my parents’ concerns. Strong-minded and confident, she eventually relocated to Colombo adjusting to the change gracefully. She developed into a much liked young woman who could move easily amongst the people she worked with, modest and deeply committed to her work, she had the personality to remain calm in the midst of pressures. She was conservative in many ways, yet friendly and comfortable around people. Ramani was neither blessed nor burdened with the aggressiveness and ambition that fuelled many artists. She had a spiritual solidity about her, pleasant and affable leaving everyone she met in general with an indelible spark. Although my parents’ had a grounding influence on her life, attaining fame at such a young age can be overwhelming, and at times an isolating experience. It was on a Monday early morning, in late June, my parents received the news of Ramani’s accident, her hospitalisation and her immediate surgery. I couldn’t have imagined worse news, when my parents by her bedside in intensive care were told by her doctors that she was not responding. Shattered, reeling with pain, my parents agreed not to hold on, but to turn off her life-support, letting her go. When Ramani passed away tragically on June 30, 1987 she was short of turning 21. Life faded to grey and I watched the light go out. The branches of the trees appeared to droop a little, and the birds murmured in their sleep, as Ramani, dressed almost like a bride remained at home for a few days for the thousands that drifted up to the house to grieve with us. People gathered around the house and the streets, they were everywhere. My father gave us the strength to cope with the circumstances and the loss, responding to the media and her many fans. I watched him age overnight, his hair turned grey, and the sorrow weighed down his shoulders as he struggled to stay above a wave of anguish. I watched him lost in his thoughts travel back and forth making funeral arrangements, attending to the burial and a court case. In the quiet of the night I heard his painful sobs. As I watched my father grieving, I knew that not even the thought of angels could comfort him when heaven had stolen a daughter so soon. Even though comforting friends came around, the intense grief was impenetrable, isolating the soul. The dust settled for the story of our lives to unfold when we migrated to Australia to start life again. Yet, all these years later, any reference to my sister Ramani still called to me, sometimes enough for the tears to simply fall. Hearts, broken with missing pieces, clearly our deepest emotions are beyond words. Outside my window, the full moon has risen high in the sky and stars are strung across the night. I watch them twinkling like diamonds, changing colours pink, white and gold, dancing with so much energy, I swear I heard my sister calling, or was that the breeze of a thousand leaves breathing!